When you hear their names, which image/version of the tennis player pops up first in your mind ? Basically asking which paricular version you associate with them instinctively. Federer in 2005 WB outfit or 2009 WB( the one with the golden collar edges) , come to mind when I hear his name at a place I don't expect to. Nadal is forever etched in my brain as the pirate pant wearing ,sleeveless and vamosing youngdal of around RG 2006. 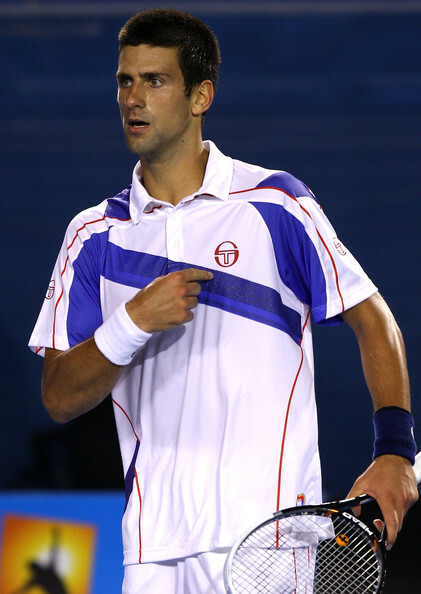 For Djokovic it's his 2009 Miami blue and the cap. Murray, the 2010 AO Highlands white outfit . For Roddick it's USO 2006. For Stan it's of course the 2014 AO . It's funny how it still hasn't truly sunk how much time has passed. To think I saw Djokovic as an 19 year old playing his first Slam final and now he is over 30 , part of me still believes some of Murray's HC masters runs in 2008-10 were better than anything he ever produced. I think tennis really was very exciting earlier now it just doesn't invoke the same kind of interest in me. It feels weird seeing Fedalovic play 50% of their peak and take every major with ease. It's usually the last thing I saw them in. Not like I still picture Rafa in capri pants or Novak in Adidas. I've even gotten used to Federer in Uniqlo by now. At 2018 AO, jsut having lost a set and looking very serious, atm, or else he is smiling. Either this or the late 2010 Dragonvic. The image of Novak Djokovic I get is the peak form, sliding, elastic-band athleticism and patented swashbuckling brand of tennis from AO11. He's never dominated a Slam so thoroughly since. Either this or AO08. Darth Fed in sleek all-black, the name itself striking fear in the hearts of opponents. That's Roger Federer for me. It took me longer before an image of Murray stuck with me, but it has to be this one. Coincidentally, as with Federer, consider this to be his best kit. Was at his absolute best at AO13. Nadal = 2007 Australian Open. Djokovic = 2012 Australian Open. Roddick = 2004 Australian Open. Hewitt = 2005 Australian Open. Wawrinka = 2014 Australian Open. Safin = 2005 Australian Open.